Handwriting for Heroes 3rd Ed. now available! Thanks to the feedback we have received from everyone on the earlier editions of Handwriting For Heroes, we are pleased to announce the 3rd Edition. This edition is available now directly from the publisher. Amazon.com now stocks the 3rd Edition . Bookstores can order direct from the publisher or from New Leaf Distributing. H4H remains the only program specifically directed towards adult re-learners. Revised and updatd exercises structured for either cursive or print (manuscript) re-learning. resiliency in your daily life. As always, we invite Certified Hand Therapists to request a complimentary evaluation copy to learn whether Handwriting For Heroes is right for your clients. Write to victor@LHPress.com and be sure to include your complete mailing address. 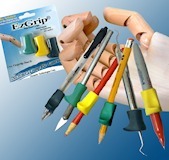 We love EzGrips and look forward to proposing collaborative marketing whereny we can present EzGrip coupons to hand therapists and their patients. Next Next post: What can I do to improve after completing Handwriting For Heroes course?